Climate change is reshaping how we think about conservation. Even if fully protected from the ongoing threats imposed by human activities, the ecosystems and biota we have been protecting will not remain the same. Conservation planners must change the way decisions are made because aspects of the environment we have always considered to be relatively constant, including weather patterns, water supply, temperature extremes, even biotic communities, will be changing. This is a difficult endeavor because, not only can we not predict exactly how things will change, but we don’t know when they will achieve a new stable state. We can no longer plan for stasis. With these ideas in mind, the African Wildlife Foundation and the International Gorilla Conservation Programme have partnered with EcoAdapt to initiate the development of an adaptation framework to address climate change in planning in the continuing efforts to conserve mountain gorillas (Gorilla beringei beringei) in East Africa. With a grant by the John D. and Catherine T. MacArthur Foundation, a series of Climate Camp workshops in the region were held and expert research commissioned to produce this initial White Paper. 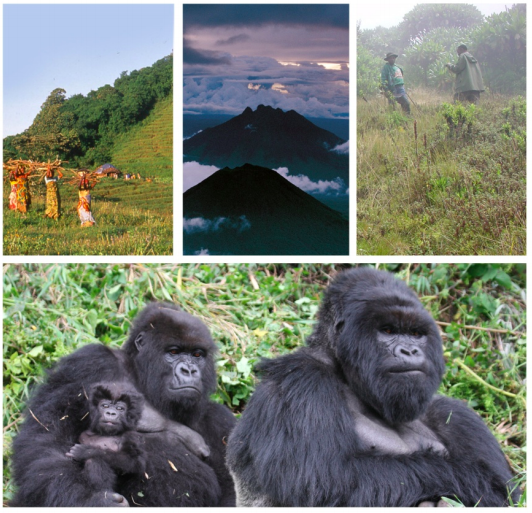 The work focuses on building understanding and assessing the scope for reducing the vulnerability of mountain gorillas to regional and global changes expected to occur as a result of climate change. The goal is to reduce the vulnerability of mountain gorillas to the negative effects of climate change by understanding and accommodating its effects on their habitat, food supply, and access to water resources. The specific task of the White Paper preparation process was to carry out initial multi-stakeholder assessment of the implications of global climate change for mountain gorilla conservation in the Albertine Rift, and identify key elements of an adaptation framework, including priority adaptation strategies and actions.